This time it would work. She would lose the weight in tome for her birthday. And maybe she’d say yes yo that holiday in Thailand Sean was always nagging her about. Tomorrow she would start on the readiness tasks she was supposed to do before Monday when the program kicked off. But tonight she may as well finish off the rest of these chocolates. After all, the first task was to rid the house of any tempting foods. Four women who have never met in person connect through an online forum. They are all very different: one is a young mother, with a rocky relationship and no family support. Another is happily married and a successful businesswoman, but longs for a child. A third has it all – career, children and a happy marriage. The fourth has moved backwards in her career to be closer to her lover. What connects these very different women is that they are all very overweight, and have joined the forum in a desperate attempt to lose weight. At first online and, later, in person, they become friends and support each other through times much harder any of them could have imagined. The Shape of Us is a story about friendship. Though weight loss (or the desire to lose weight) is what brings the friends together, they connect and support each other in many different ways, and weight becomes almost a background issue. The use of a blend of third person narrative and blog entries from the perspectives of all four women is an unusual and effective means of getting inside each character’s lives and emotions. Although weight loss ceases to be the overriding issue of the book, the differing weight loss experiences of the characters, as well as their experiences surrounding being overweight, is an intriguing premise for a book. Issues of family support, body image, infertility, surgical intervention and more are explored. At heart, though, this is about the bonds which bring women together and the ways they support each other. From the appointment of the Controller, Colonel Sybil Irving, on 29 September 1941, until the cessation of hostilities in August 1945, over 24,000 girls and women enlisted as volunteers in the Australian Women’s Army Service (AWAS). From different places, from different backgrounds, by varied routes, they were now together, the members of the Australian Women’s Army service. As the first raw recruits were marshaled onto a bus for Killara, talking non-stop about what lay ahead, they heard cries of ‘You’ll be sorry!’ but they never were. In Word War 2, as men serviced in Europe and Asia, the homefront faced struggles, too, not the least of which was the shortage of staff. Australian women, who wanted to contribute, campaigned hard to be allowed to enlist and, finally in September 1941 the Women’s Army Service was formed. Between then and the end of the war, thousands of women volunteered and served in a wide variety of roles including driving, logistics, administration, communications and more. Giving their all for the service and ‘doing their bit’, these women later found themselves at a loss when the war ended and the expectation was that they would return to home life as quickly as possible. You’ll be Sorry: How World War II Changed Women’s Lives traces the stories of these women through the war years and after, using testimony and recount from the women who served and from family members. Easy to read, the book provides an in depth insight into the types of women who served, their roles and lives within the service, and the challenges of life afterwards. Verla and Yolanda are among ten young women who wake up from a drugged sleep not knowing where they are or why they are there. But as the day unfolds, so too does their terrible situation become clearer. They are in a prison unlike no other: in abandoned buildings on an unknown remote piece of land, surrounded by electrified fences. There is no escape, and their jailers are two men with no compassion and not much idea what they are doing. Their heads shaved, their clothes taken away and replaced with ugly, itchy uniforms, the women are to perform hard labour in a regime which is supposedly intended to reform them. Their crime? Each woman has been part of a sexual scandal with a powerful man – though these relationships were, for the most, not consensual. 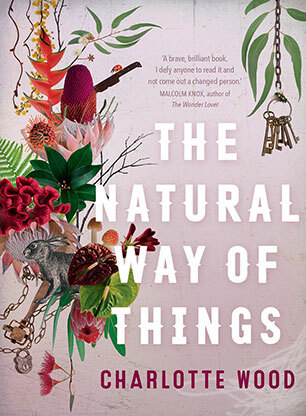 The Natural Way of Things is an uncomfortable book, dealing with often shocking events playing out as part of a terrible, unfathomable injustice. But it is this discomfort which makes the book so brilliant. The readers is taken on an emotional journey through a raft of emotions including despair, denial, anger, hope and more. The characters, particularly Verla and Yolanda, are intriguing, and their developing relationships fascinating. Exploring misogyny, corporate control, this dystopian novel is a must read for women and for men. Imagine having your face on every Australian fifty-dollar banknote. It doesn’t mean that you own all that money, but it does mean that you have done something important. There’s even a saying: a person of note or a notable person. Have a close look at the fifty-dollar note. Most people don’t notice anything except the fact that it will buy fifty dollars’ worth of something. But the design includes a picture of Western Australia’s original Parliament House, and an illustration of a mother and children. And a picture of a woman standing up and speaking in public. These are notable clues. Edith Cowan was born on a pastoral property in Western Australia before moving to Perth to boarding school. Her mother died when she was seven and when she was a teenager her father was convicted of murder and hanged. But rather than let tragedy define her, Edith developed a quiet determination to live well and to help others, particularly women and children to live well too. She married and raised her own family, but realised that many other women and children were suffering because of poverty, mischance and lack of education. She was active in fighting for the vote for women and became Australia’s first female parliamentarian. Text is interspersed with colour illustrations and there is a timeline in the final pages. 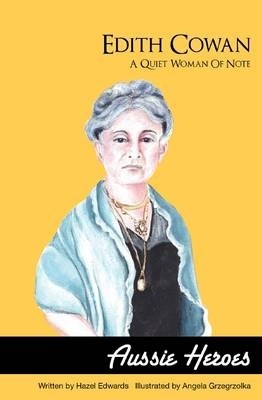 Edith Cowan: A Quiet Woman of Note explores the life of one of Australia’s quiet achievers. Although her achievements are recorded in books and biographies, there are few books that are designed to introduce this pioneering woman to young readers. The ‘Aussie Heroes’ series aims to rectify that by presenting the stories of notable Australians in a format that is accessible to young readers. Readers can discover not just why Edith is remembered, but about the childhood and early life that helped to shape her. Information is presented in a conversational style, with history of the time providing context to her decisions and endeavours. Recommended for mid-primary readers. Ruby stares at the letter and wonders why she isn’t crying, why the threat of that first sob has dissipated, why not a single tear is sliding down her cheek. It contains too much, she thinks, too much of her past, too many complex and conflicting emotions; it’s an ending which both robs and liberates. When Ruby hears that her lifelong friend Cat has died and left her a controlling interest in a lavender farm in Australia, her emotions are mixed. Her relationship with Cat stretches back sixty years when they travelled together as orphans unwillingly sent to Australia. Together they survived the difficult years that followed, but in adulthood they became estranged. Now Ruby knows she has left it too late to visit Cat one more time. Declan, too, has not spent as much time with Cat as he should have. Her nephew by marriage, he has spent much of his life drifting, but his share of Benson’s Reach brings him back to the place he loved as a child. His friend Alice also needs refuge, so Declan invites her to the farm, too. Declan and Ruby are just two of the group of relative strangers who find themselves forming a kind of family as they work together to revitalise Benson’s Reach and follow Cat’s dreams. Each has ghosts to confront and must struggle to find peace, but perhaps they have more chance of doing so together than individually. In the Company of Strangers is a moving tale of friendship old and new, exploring issues of forgiveness and self discovery. Set on a fictional tourist development int he South West of Western Australia, the novel focuses on characters from diverse backgrounds, allowing the reader to get to know each intimately. There are also mysteries and an exploration of the history and impact of the Child Migrant Scheme between the UK and Australia during World War II. One of Byrski’s strength is in her ability create well rounded and interesting mature female characters, which she does here as well as previously, but the male characters also shine, and every character has layers which are gradually unwrapped as the tale progresses, keeping the reader surprised. All those things no one ever tells you about motherhood. It’s like secret mothers’ business. Lots of my friends had babies before me, but not one of them ever told me it would this hard…It’s like a code of silence. Six very different women are brought together by one thing – they are all new mothers. Each comes from a different background and has a different experience of birth and the early months of a first child, but they meet through a mother’s group and determine to meet regularly and support each other through this new stage of their lives. Over the course of the year the six become friends, but they also fight and disagree. Their circumstances are so different – from bringing up a child alone, to having a new baby plus a step child to care for, to struggling to adapt to a new culture. But what they have in common is their first child, and the tumultuous experience of the first year of motherhood. The Mothers’ Group is a book which anyone who has ever navigated the highs and lows of motherhood will connect with. The varied cast means most readers will either see themselves in one or more of the characters, or will at least recognise someone they know. But it’s not just about sleepless nights and nappy changing – characters are faced with a range of big issues alongside the seemingly small ones (though anyone who has ever navigated the sleepless nights knows it is not a small issue). The Mothers’ Group is a moving, heart-wrenching read.